Our service department turnaround is 24 hours or less! 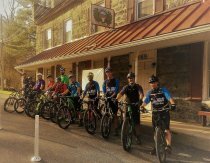 Ellicott City's local bike shop featuring full service and sales for every bike and rider. Call or come in today for laid-back fun and the area's most fair and friendly service. @Roadies: When was your last bike fit? Has it really been a decade? We can help bring you up to date. Call for more details and to schedule a fitting. Our Mechanics have extensive twenty-plus years of experience so you can have your best ride yet. Advice is always FREE! We host weekly Group Rides on Tuesdays and Saturdays.